Did Someone Say "Chocolate"? Yes, Please! Enjoyed in moderation, there is nothing wrong with a little indulgence every so often. Chocolate is one of those indulgences, and often we feel guilty about enjoying it because we know it is high in sugar, fat and calories. But there is some good news! As you may know, chocolate is made from cacao beans which come from the fruit of the Theobroma cacao tree. The cacao beans are fermented, roasted, ground and then separated into cocoa powder and cocoa butter. Chocolate is made with cocoa, which contains an antioxidant called ‘flavanol’. If you aren’t familiar with what antioxidants are, they are found naturally in food. The role of antioxidants in our bodies is to protect our cells from damage caused by potentially harmful molecules called “free radicals”. Free radicals are formed during normal body processes or they can come from external pollutants (i.e. smoke or air pollution). Antioxidants, such as flavanols protect our cells from the damage caused by these free radicals. Now, coming back to the good stuff: chocolate. You may have heard that chocolate plays a role in the prevention of chronic diseases because of its beneficial effect on heart disease and blood pressure. In a 2015 study published in the American Journal of Clinical Nutrition, it was found that cocoa flavanol consumption improved cognitive (mental) function, blood pressure and the cholesterol levels in elderly test subjects. Keep in mind that at this time there are no long-term studies to assess the effects of chocolate on cardiovascular (heart) health, but many short-term trials have examined the effects of cocoa and chocolate on specific aspects of cardiovascular health. And… There’s even better news! Flavanols aren’t only present in chocolate, other food sources include: tea, red wine, beans, apricots, cherries, grapes, peaches, blackberries and apples. Enjoy chocolate in moderation and maintain an active, healthy lifestyle. The processing techniques used while making chocolate significantly reduces the amount of flavanols present, so when choosing your chocolate indulgence, aim for dark chocolate with at least 70% cocoa. 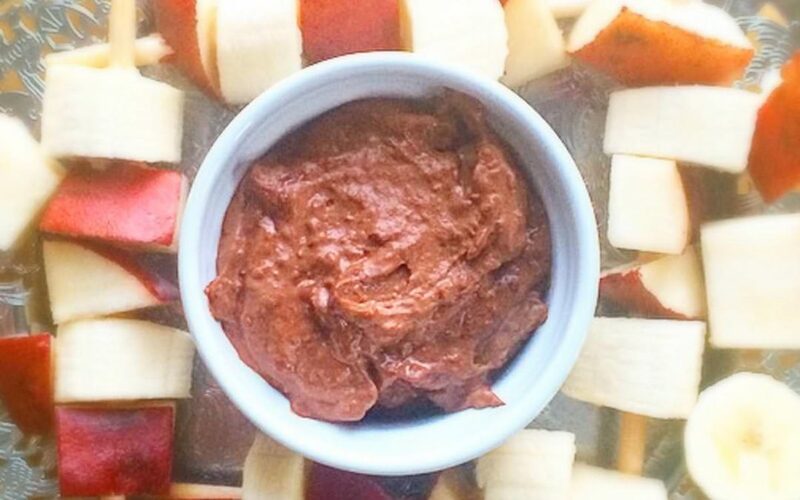 Want to create your own healthier chocolate fruit dip? Try making Chocolate Hummus! Combine all ingredients in a blender and blend until smoothMastroiacovo, D. et al. Cocoa flavanol consumption improves cognitive function, blood pressure control, and metabolic profile in elderly subjects: the Cocoa, Cognition, and Aging (CoCoA) Study – a randomized controlled trial. Am J Clin Nutr 2015;101:538-48.